ThinkGeek using Papyrus? | Papyrus Watch - Exposing the overuse of the Papyrus font. Our friend Kyle spotted this in an email from ThinkGeek. 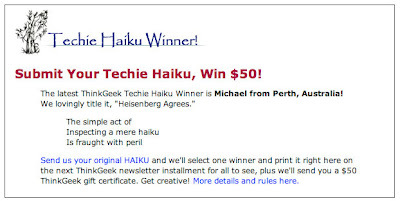 They appear to be using Papyrus as the title font for their Techie Haiku...they must think it represents the "haiku" portion and surely not the "techie"...still, coming form ThinkGeek it's a bit odd still, unless it's a joke...yeah, that makes more sense, right?